Let Sussex surprise you! 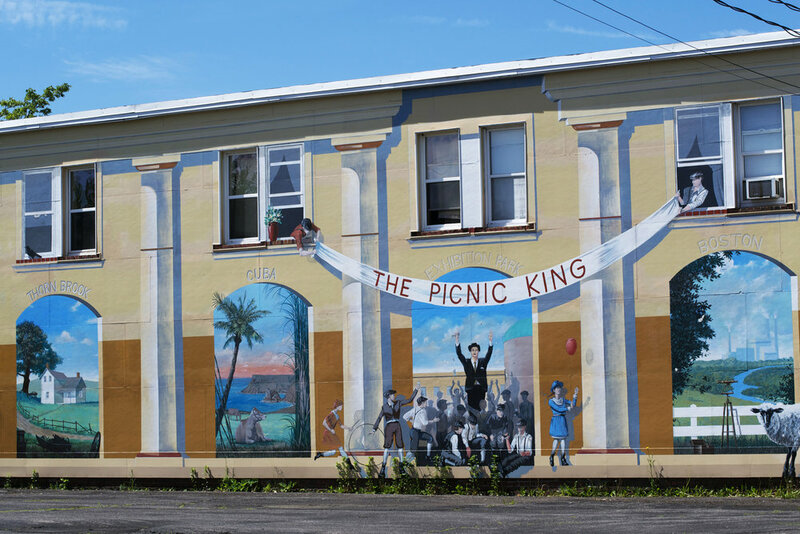 Recently, my sisters suggested we meet up in this small town to check out the massive mural project, wander around the heritage buildings and the cute gift shops & then have lunch at one of the sweet cafes. After that, they suggested, we could explore the beautiful countryside to see the rolling hills, farms, rivers and covered bridges. They said I would be surprised at everything Sussex has to offer and I would love it all. 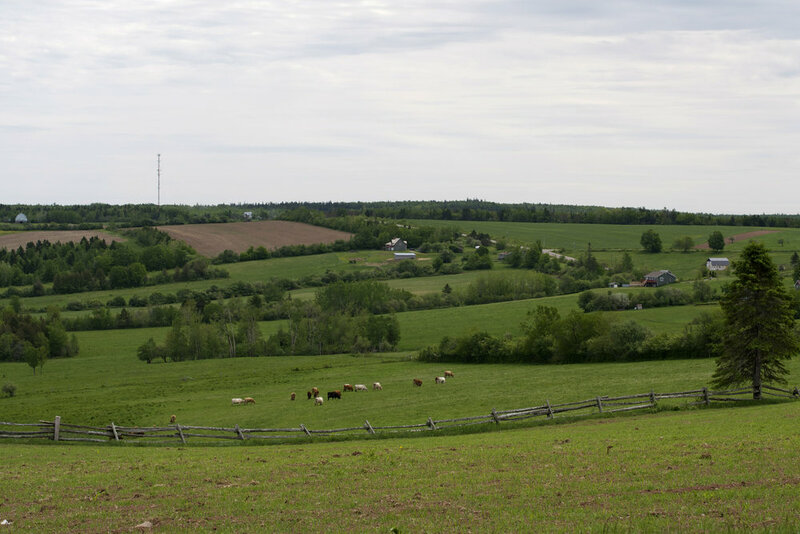 Centrally located in New Brunswick makes this rural community an easy day trip from Fredericton, Saint John or Moncton. 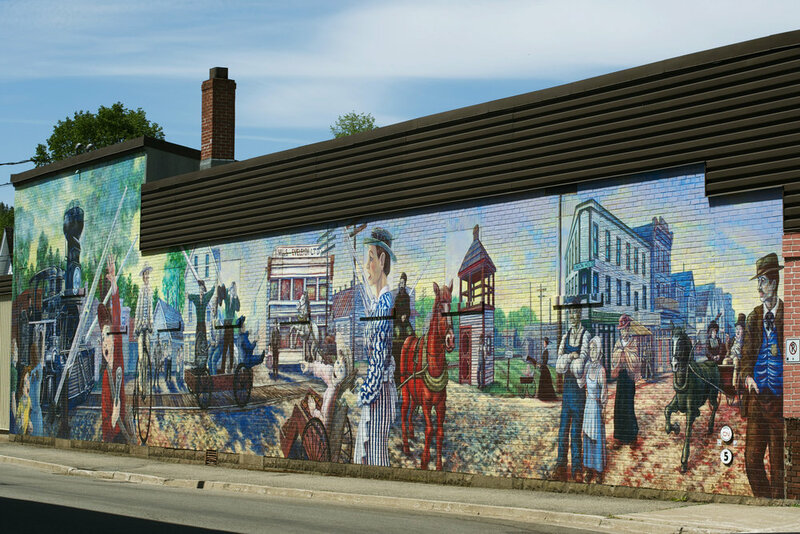 It was a wonderful place to meet to spend a relaxed day together and my sisters were absolutely right; Sussex surprised me with its artwork murals, quaint downtown & its rural beauty. I loved every minute & this city girl also appreciated that the parking is free here! Before I even made it into the downtown, 'Come Bye Chance Antiques' had me craning my neck then doubling back on Highway 10, to check it out. I enjoyed chatting with the owner Louise Flaglor and I left with a lovely old handwoven basket and a bag of vintage bottles. This adorable scooter certainly caught my eye too and I promised Louise I would be back again soon with antiquing friends. 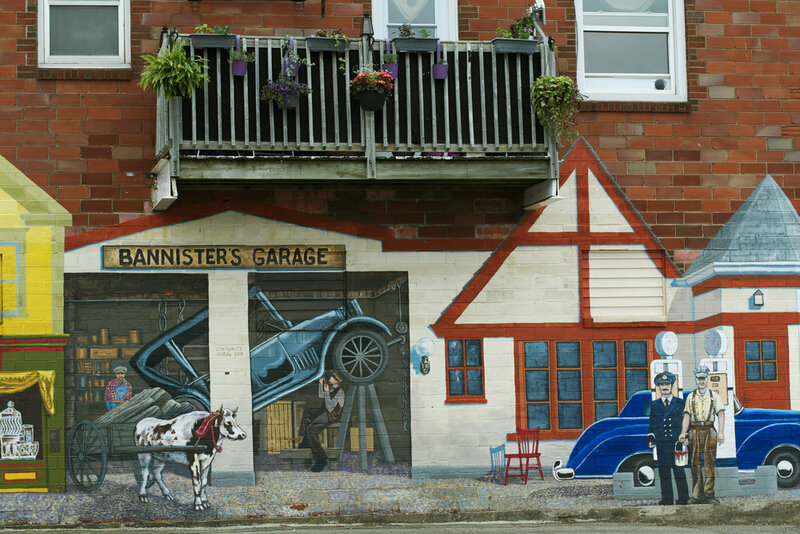 Be awed by the town's newest claim to fame as 'Mural Capital of Atlantic Canada'. 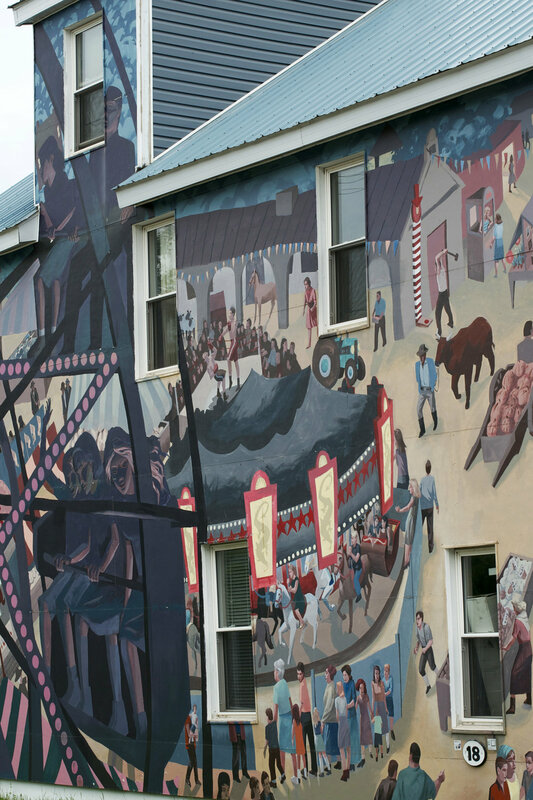 Walk the town's history told through 27 massive murals painted on twenty-three buildings throughout Sussex and four in nearby Sussex Corner. 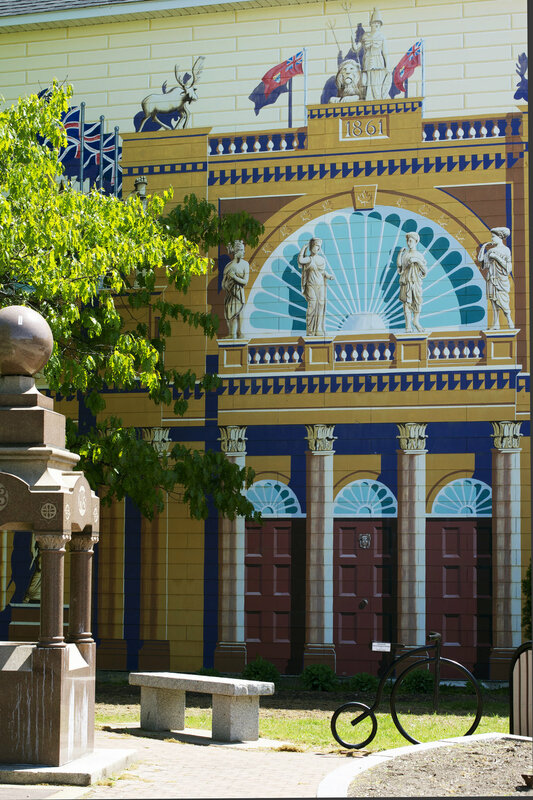 Official walking guides with all the fascinating historical significance of each painting are available for $2 at the Visitor Information Centre located in the Railway Station. It will aid you in locating all the murals (map included) and it makes appreciating the artworks origins so much more meaningful. 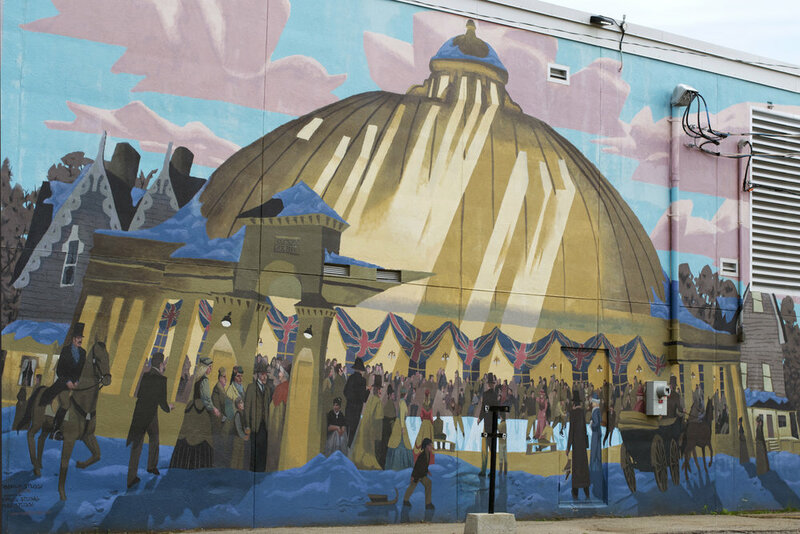 Proceeds for the brochure go to the talented international artists that were part of this Mural Project that strives for economic development in the Sussex area. 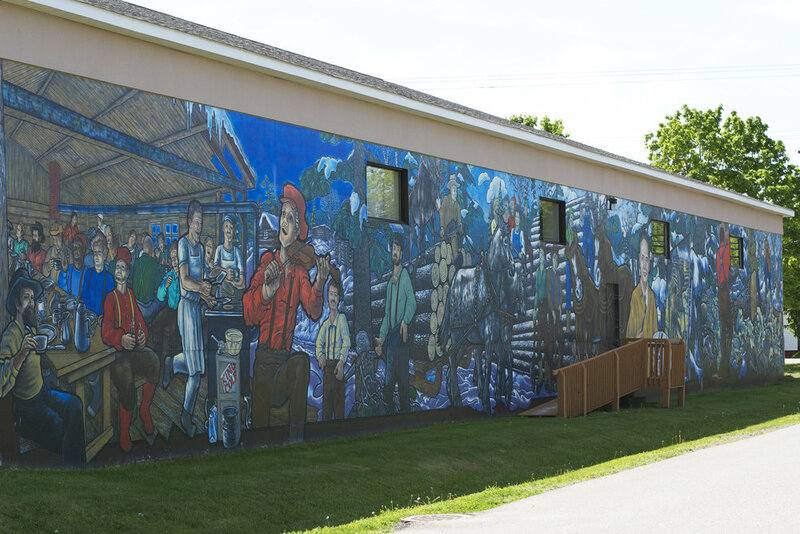 If you are looking for more local art and history, there is the Sussex Art Gallery & the 8th Hussars Military Museum in town too. 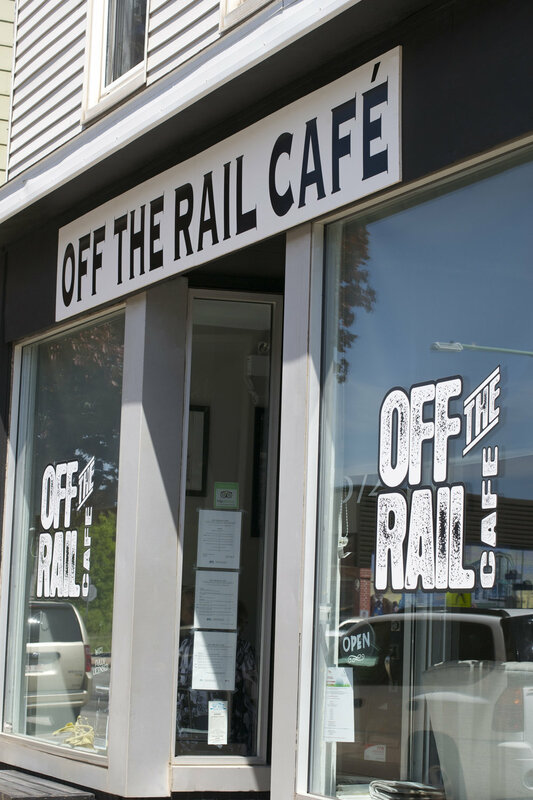 There are many options for great places to eat in downtown Sussex, but we chose the healthy & organic 'Off the Rail Cafe' and we enjoyed a wonderful lunch in this charming cafe. Fresh, local ingredients from local farmers and rich organic Canadian 'Kicking Horse Coffee' from British Columbia really make this cafe special. Gluten-free and vegan offerings are also available too. The decor is lovely, service was excellent, and the staff were very friendly. My two sisters and I thoroughly enjoyed our delicious 'Uptown Club' and 'Chicken Salad' sandwiches made with Wanda O'Donnell's fresh homemade multigrain bread ~ so much so, we each bought a loaf to go. Thank you Wanda! I'm still enjoying it back home. Stop to have a bite here & tell them the Maritimes Maven sent you! A countryside that begs you to go slow and take in the picturesque patchwork quilt of farmland spotted with grazing dairy cows and horses awaits you just outside of town. 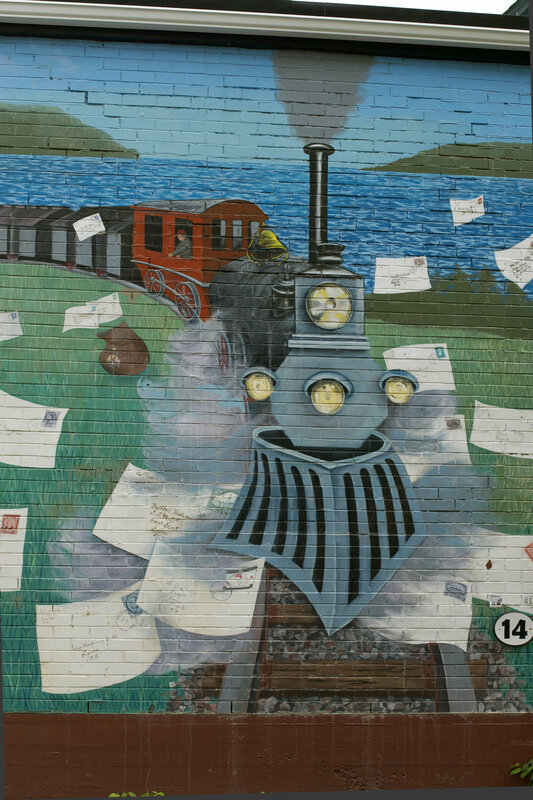 Venture out in any direction and discover the rolling hills, farming communities, wooden covered bridges, train tracks and secret fishing spots. 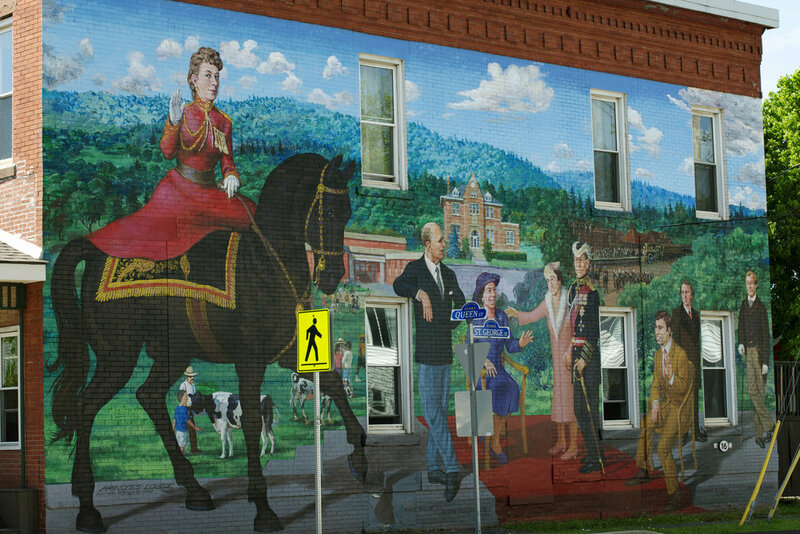 Sussex sits in the juncture of River Valley Scenic Drive and the Fundy Coastal Drive. It is well known as 'The Gateway to the Bay of Fundy' & The Fundy Trail. 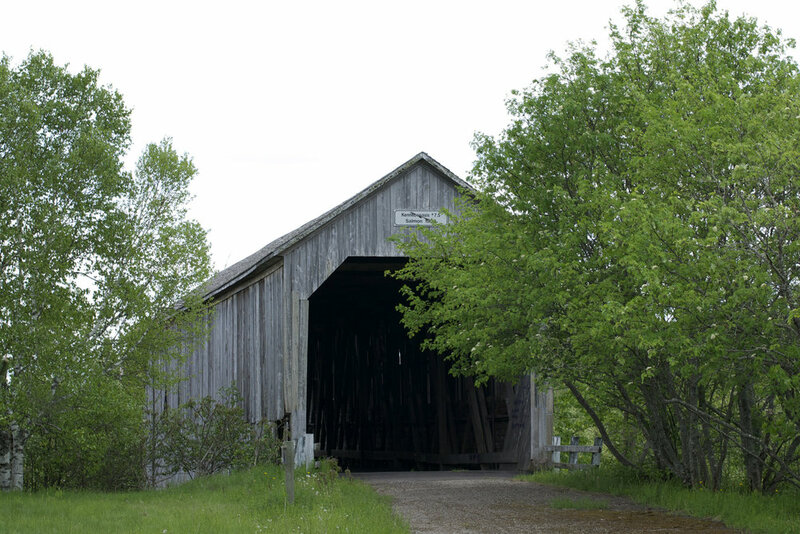 Sussex is the 'Mural Capital of Atlantic Canada', the 'Dairy Centre of the Maritimes' and it also holds the title of 'Covered Bridge Capital of Atlantic Canada'. There is so much to see and do here. What are you waiting for? Let Sussex surprise you!